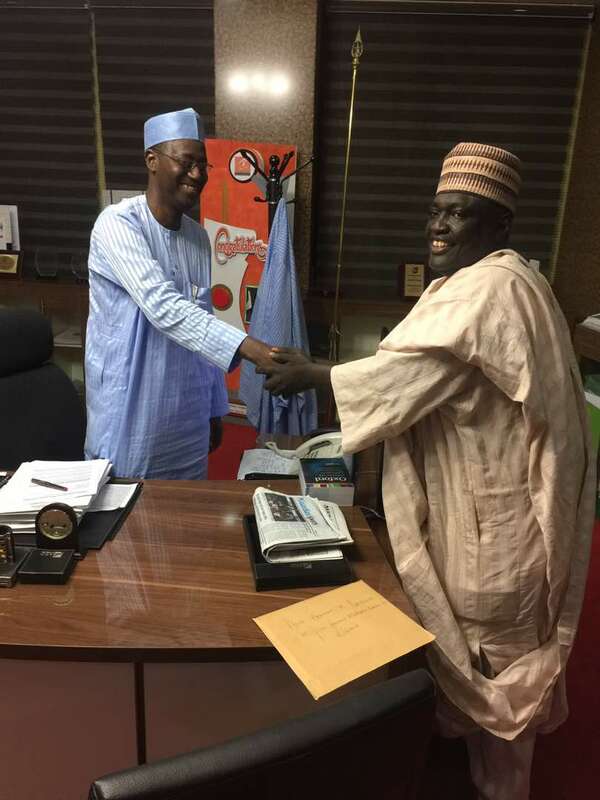 AMINU BALELE KURFI(DAN -AREWA) PAID A COUTESY CALL TO CONGRATULATES ARCHITECT AHMED DANGIWA ON HIS WELL DESERVE APPOINMENT AS MANAGING DIRECTOR/CEO OF FEDERAL MORTGAGE BANK OF NIGERIA (FMBN) BY HIS EXCELLENCY , MUHAMMADU BUHARI, PRESIDENT AND COMMADER-IN-CHIEF OF THE ARMED FORCES. 1.On the behalf of my humble self, I rejoice with you and your family on your well –deserved appointment as the Managing Director/CEO of Federal Mortgage Bank of Nigeria (FMBN).It is heartwarming for me and a great delight to congratulates you for this special recognition and elevation to an important national position by His Excellency, President Muhammadu Buhari. 2. Your appointment is, therefore, an eloquent testimony to the confidence reposed in you by Mr President. It is also endorsement of your ability to lead an institution that is critical to the socio-economic development of the nation at this junction in the country’s development trajectory. In the same vein. It is gratifying that your appointment came at quite an auspicious time when the present administration is striving hard to fulfill its electoral promise of delivering quality and affordable housing to Nigerians. 3. I am ever confident that your sterling qualities that recommended you for this important national assignment of hard work, patience, commitment, discipline, dedication, and sincerity of purpose will come to bear on the attainment of this noble objective of the Federal Government and aspirations of the citizens. support you may require to make a difference. 5. All said, I have no doubt that knowing your antecedents and rich pedigree, you will also use your tremendous experience, expertise, high intellect and clear vision to steer the affairs of FMBN to an unprecedented level. I pray the Almighty Allah will guide you and crown your tenure with success.